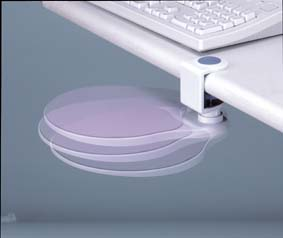 Ergonomically designed, under desk swivel mouse pad. Brings mouse platform down to armrest level of chair, reduces arm movement. Feature:Sturdy metal clamp attaches firmly to any desks up to 40 mm (1.57") thick. 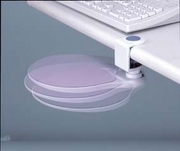 Platform rotates 360, tucks under desk when not in use. Built-in mouse cable clip keeps mouse in place. This is an excellent company to do business with. From the first question I asked, I found courteous, friendly and professional responses. The item I purchased was a mouse platform. Sadly, it didn't work where I needed it. My request for a return authorization was met with the same attitude as my first question. I can't say enough good about this experience!